I’m pretty sure that every seamstress/ tailor wishes to have infinite yards of fabric to work on, so that they could screw up multiple times without regrets to experiment on different techniques and patterns. But the most unfortunate and cold hard truth is that we have to manage with what we have. It was one of my ‘Friday-cleaning-days’ and whilst in the middle of rummaging and sorting my chaotic cupboards full of fabric and sequins; I came across a bundle of white lace that I had cut up for a dress a couple of years back. I decided to start working on it again. The design I had chose back then was a very simple summer dress. I thought it would be challenging to make something different out of the fabric that was already cut. And there wasn’t much fabric to work on. It was tricky and I had to make sureÂ I placed my patterns right and used the maximum out of the minimum fabric that I had. Of course I always start by brainstorming for designs and sketch them up before picking the right oneÂ to sew. Lace is such a classic that it’s still every designers fave. 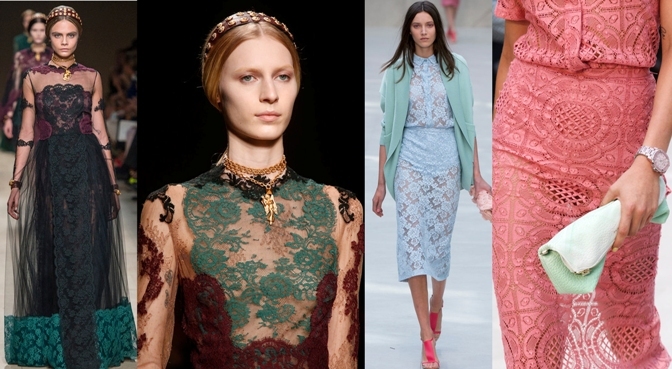 This season (spring summer 2014) Burberry and Valentino, to name a few, executed impeccable lace outfits. Women have fallen in love with this dainty fabric ever since the 16th century when it started to become more available. Different intricate designs were introduced by John Heathcoat who invented the bobbin net machine in 1768. 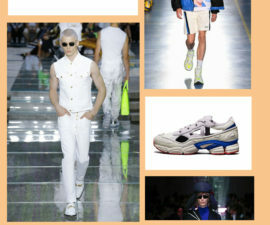 Fashion and trends have evolved greatly that there’s a bevvy of styles we could choose from today. 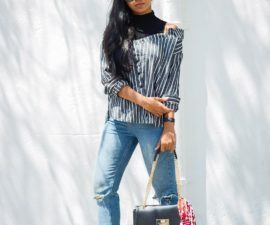 For this outfit, I was inspired to use some current trends, such as the raglan sleeve, illusion-style ; where the pattern and use of colors gives the impression of a silhouette within the dress. And of course lace! To achieve a slimming effect I used black on the sides of the body and balanced the color on the sleeves and collar. The lace, I’ve used to give different textural effects. The dress is all about balancing the strong and soft. Strong being the monochromatic colors or solid black and soft being the dainty floral lace. No image must be used without the prior written permission from Famushu.